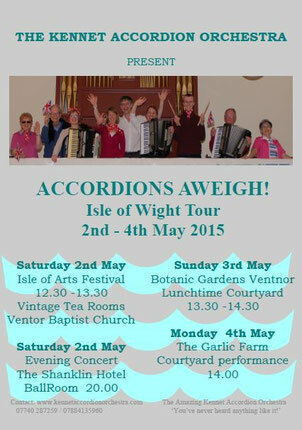 'Accordions Aweigh' - Isle of Wight Spring Tour, 2015 - Website of kennetaccordionorchestra! The orchestra travelled to the Isle of Wight on 1st May for a short spring tour, which saw the players perform four concerts on the island. Our trip coincided with the annual 'Isle of Arts' festival, which features comedy, drama, music, literature, film, photography, painting and sculpture. KAO kicked off our performances with an festival concert at Ventnor Baptist Church. We were grateful for such a large audience, who certainly seemed to enjoy the concert - along with the cream teas which were being served! Julian Lloyd-Webber was performing at Ventnor Winter Gardens that evening, so we were certainly in esteemed company. We followed our concert in Ventnor with a performance at the Shanklin Hotel on the Saturday evening. The hotel was our home for a few days, during which we were made to feel very welcome by all the staff and it was a pleasure to play for the other guests. During the remainder of the tour, we visited and performed at the Ventnor Botanic Garden and the Isle of Wight Garlic Farm. The latter was an outdoor performance, so we were lucky for both fine weather and a beautiful courtyard setting - a new experience for many of the players. You can hear a performance from the farm on YouTube. As well as the concerts, the players also enjoyed some social time together, which included a trip to a local vineyard. A special thank you from us all go to Ronkey Bullard (one of our first accordionists) for arranging these concerts and also to our coach driver Geoff, from Pewsey Vale Coaches who looked after us splendidly. You can view some photos from the trip on our gallery section.